August 22, 2011 the President of the Julius Kuhn Federal Research Centre for Cultivated Plants George F. Bakhaus representing a German delegation from the Institute for Breeding Research on Horticulture and Fruit Crops visited N.I. Vavilov All-Russian Research Institute of Plant Industry, Pavlovsk experiment station and Pushkin laboratories of VIR, where he met with VIR staff members participating in the bilateral joint project. 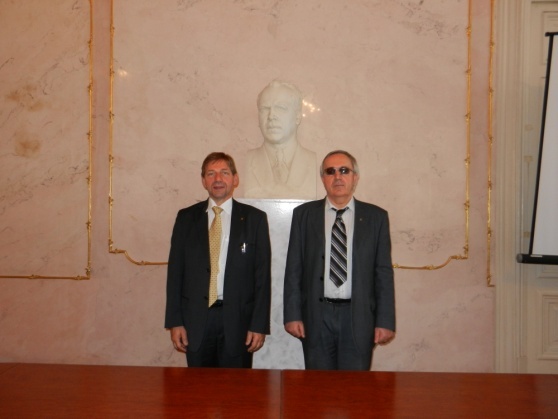 In course of the meeting George F. Bakhaus praised the results of the collaborative activities. After German delegates had flown to the Northern Caucasus to take part in the joint collecting mission the President visited VIR`s genebank and N.I. Vavilov museum. During the working meeting with VIR`s Director N.I. Dzyubenko George F. Bakhaus expressed his wish for inter institutional strengthening. As a result of the meeting there was achieved an agreement on establishing a joint working group by the end of this year, whose objective will be development of a large-scale bilateral project addressing the most urgent problems of agricultural production in Europe with the use of genetic diversity of collections of both VIR and Research Center of Cultivated Plants. Julius Kuhn Federal Research Centre for Cultivated Plants was founded in January 2008 as a result of integration of three research Centers: the Federal Biological Research Centre for Agriculture and Forestry, the Federal Centre for Breeding Research on Cultivated Plants and two institutes of the Federal Agricultural Research Centre. The headquarter of the Center is located in Quedlinburg. The Center is an independent authority subordinated to the Federal Ministry of Food, Agriculture and Consumer Protection. Its diverse tasks are stipulated in legal acts such as the Plant Protection Act, Genetic Engineering Act and Chemicals Act, and in corresponding legal regulations. The Center`s core activity is to advise the Federal government and the Federal Ministry of Food, Agriculture and Consumer Protection in particular on strategy and politics of agricultural development as well as to coordinate activities between subordinated institutions on issues related to the study of plant genetic resources (plant genetics, agronomy, plant nutrition, soil science). It develops integrated concepts for plant cultivation as a whole, ranging from plant genetics, plant breeding to plant production, plant usage and plant care. The Center is currently conducting a promising research aimed at safeguarding the co-existence of agricultural production systems either based on or free of genetically modified crops. The effects of climate change and the quality of plant compounds are the two other highprofile topics. As of 2011 the JKI is structured into 15 institutes and several service units with total 1100 staff members, 250 of which – scientists. The Center maintains a total of 600 hectares of experimental fields for outdoor testing. The experimental fields are under cultivation of agricultural crops, fruit, grapevine, vegetable, ornamentals and comprise also a forest area of around 66 hectares.